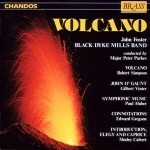 Connotations was commissioned for the 1977 National Brass Band Championship finals, held in the Royal Albert Hall, London (the winner, incidentally, of that particular competition was the famous Black Dyke Mills Band). 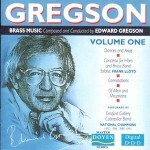 At the age of 32 Gregson was the youngest composer to have received the honour of such a commission. 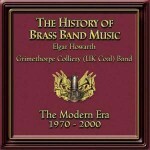 It came at the end of a productive five years writing for the brass band publisher R Smith. Some of those works – The Plantagenets, Essay and Patterns for example, with their direct and tuneful style, have remained popular with brass bands the world over. For Gregson, these were the means by which he sharpened the tools of his trade, preparing the ground, as it were, for his finest work to date – Connotations. He thought of calling the piece Variations on a Fourth, but with due deference to Gilbert Vinter perhaps (Variations on a Ninth), he chose a more appropriate one. As Gregson has written, ‘Connotations suggests more than one way of looking at something, an idea, and this is exactly what the piece is about’. Writing a competition piece brought its own problems. ‘It has to be technically difficult and yet musically satisfying. I didn’t like being kept to an eleven-minute maximum. The inclusion of short cadenzas for less usual solo instruments seems to signify a certain test-piece mentality’. 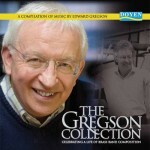 Gregson solved the problems admirably by adopting a symphonic approach to variation form: Introduction – fanfares, a call to attention, in effect Variation 1; Theme – a six-note motif, given a lyrical and restrained first statement; Variation 2 – a delicate toccata; Variation 3 – typically robust in melody and rhythm; Variation 4 – lyrical solos; Variation 5 – a scherzo; Variation 6 – cadenzas; Variations 7-9 – an introduction, fugato and resounding restatement of the theme.